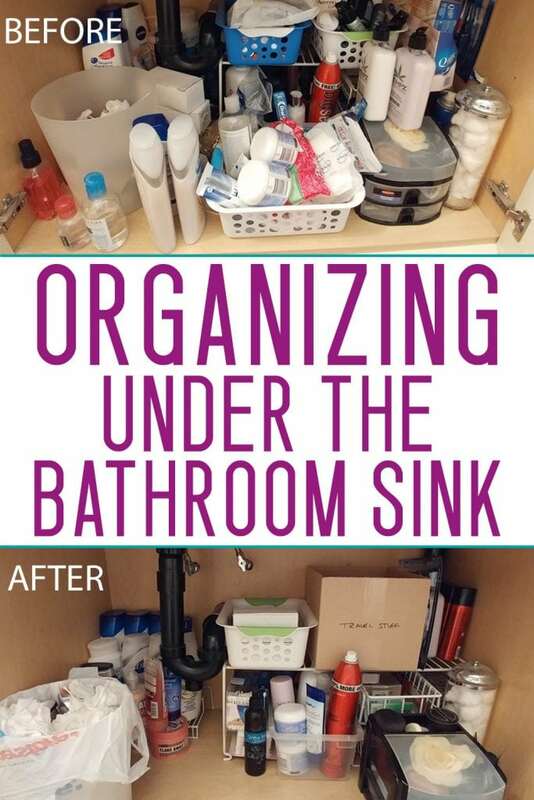 I’m on a decluttering / organizing rampage and the cabinet under the bathroom sink was in need of attention. If you’re here looking for suggestions on “how to organize the cupboard under the sink” then bear with me. More important things need to be discussed first. My decision to organize under the bathroom cupboard has brought me face to face with some hard truths. 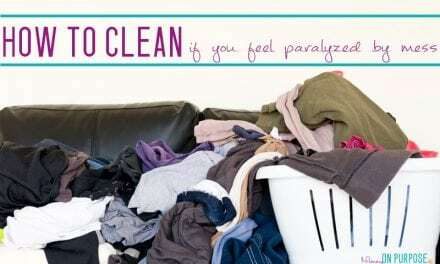 I think these truths are something I need to confront, and perhaps, if you are constantly “organizing” or “decluttering” they are truths you need to confront them, too. ♥ TRUTH # 1 – An “organizational system” won’t solve your clutter problems. 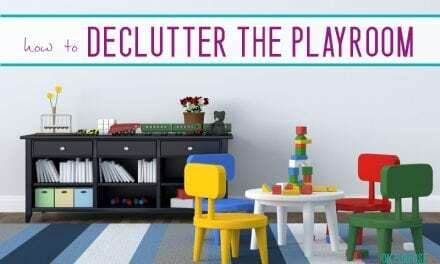 YOU are your clutter problem. ♥ TRUTH # 2 – Being dedicated to decluttering and simplifying means making some hard decisions. Choosing to live with less clutter means choosing to have less, and if I truly value having less I am going to have to do some hard things. There are two things here that make me realize this – firstly, the unnecessary stockpile. Secondly, and more convicting-ly (I can make up words if I want to), there is a tub under the sink of random things that I have kept every. single. time. I have “decluttered” under my cabinet. I’ve had these things for years and never used them… but justified keeping them because they’re great and useful things – some of them expensive – and I would most definitely use them someday, so I’ve hung onto them every time. 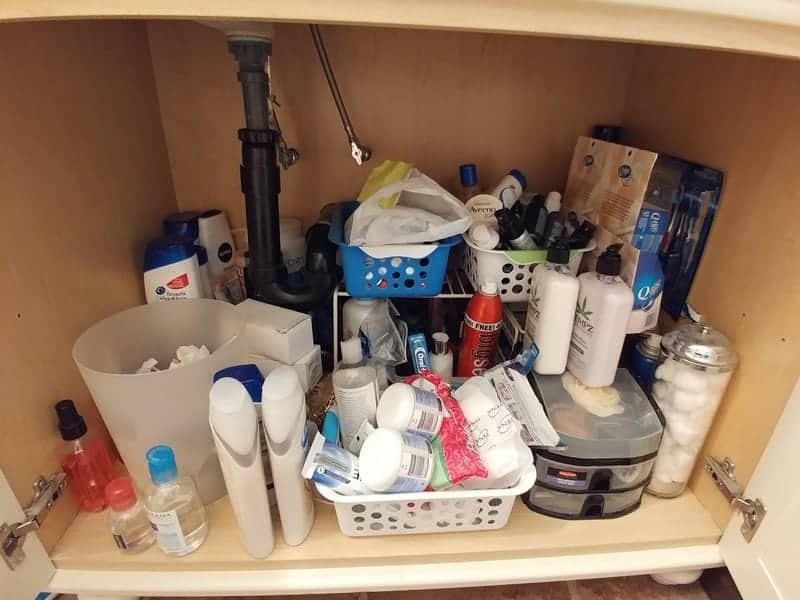 I have used NONE of the things, not even one time, since the last time I “decluttered” the bathroom cabinet. Very expensive MAC concealer (that concealed NOTHING), which I felt like I had to keep because I paid out the nose for it. Sunless tanning lotion that works great and I’m sure it’s an awesome idea, but I literally NEVER bother to put it on. Homemade bathbombs that grease up the tub when I tried to use them but I felt so wasteful throwing them out. Eye shadows that were practically new – um, because I don’t use them. ♥ TRUTH # 3 – Bad messy habits creep back when you’re not diligent! Let’s face it – that cabinet is not owned by someone who is naturally tidy, but just looking at it makes me cringe. I hate messy, and I have worked very hard to quit being messy in my home in general. BUT here, the door can close and the mess can be hidden… and it’s easy to let this area slide. You can organize and declutter all you want, but if you’re not committed to simplifying and staying tidy, don’t bother. How long will it look like this? It’ll remain organized and tidy as long as I choose to keep it that way. It’s actually that simple. As long as I choose to remind myself I don’t need to stockpile, as long as choose to take the extra moments to put things in their rightful places. As long as I throw out the greasy bathbombs as soon as I find out I don’t like them. 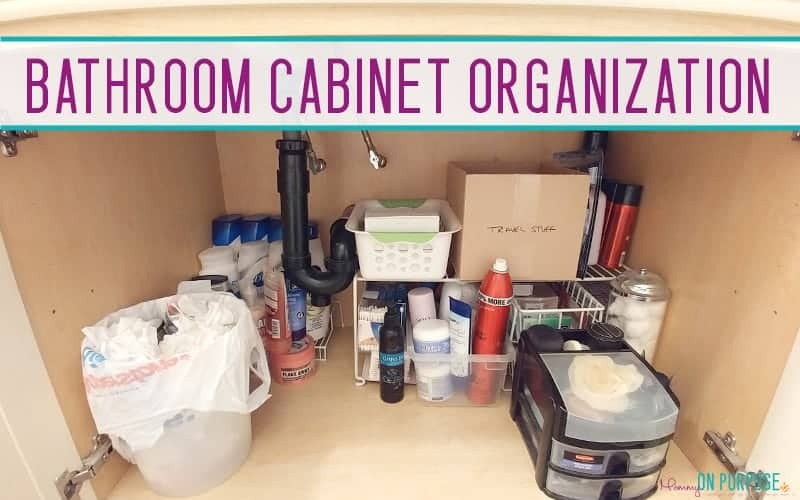 If you weren’t stopping by for a lesson in living simply or self reflection, and you just really do want bathroom cupboard organization ideas, well, these storage tips DO work for me (when I choose to use my systems). Use shelves to make use of the upward space. Don’t just sit everything on the floor! I grabbed one like this from the thrift shop for 3 bucks (- I think the one I got is meant to hang… but who cares? 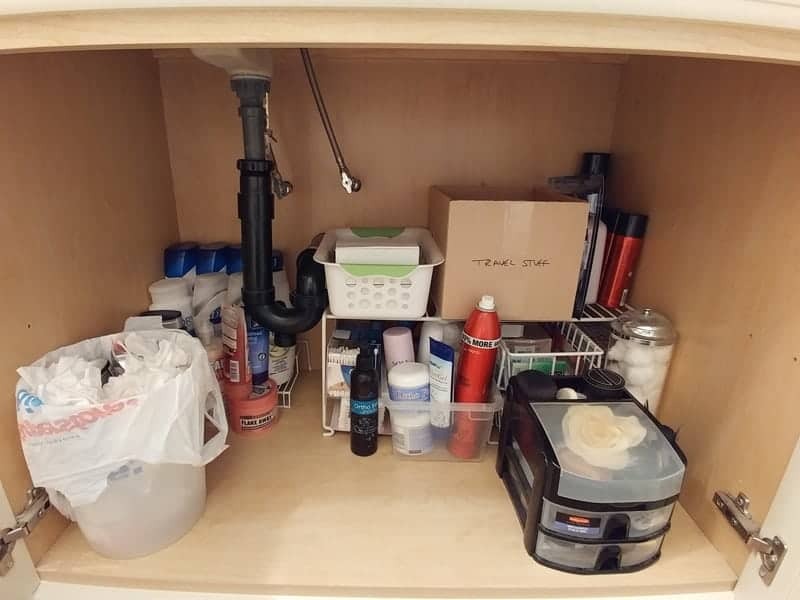 I’ve also got a spice rack shelf in the back corner that holds my shampoo / body wash stockpile so I can SEE what’s there with one glance- nothing is hiding. Plus, when the spice rack shelf is full, I DO NOT NEED to buy more of these things. Even if there is a sale. Period.